. 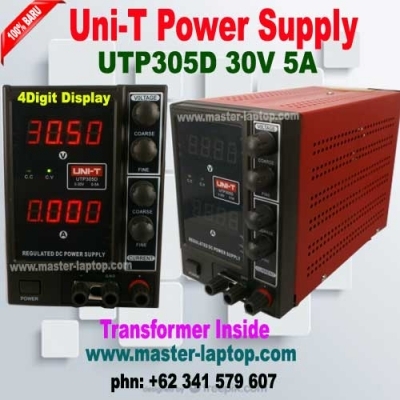 Description: UNI-T UTP305D Precision Variable Adjustable DC Power Supply Digital Regulated Switching Power Supply For Laboratory. Features: 1. Adjustable DC regulated power supply. 2. Compact design, lightweight and portable. 3. Over-current protection and short-circuit protection. 3. It has high accuracy and reliability. 4. An ideal replacement for the old one.
. 5. Designed for scientific research, product development, laboratories, universities, mobile computer repair and electronics production line and more. Specifictions: 1. Power voltage: AC 110V/220V ±10% 50HZ/60HZ. 2. Output Current: 5A. 3. Power Effection: CV 1 x 10-4 + 3mV; CC 2*10-4 + 3mV. 4. Load Effection: CV 1 x 10-4 + 2mV; CC =5mA. 5. Ripple and Notice: 0.3mV(Effective Value)=5A(0.5mA). 6. Operating Temperature: 0-40's, RH=85%. 7. Storage Temperature: -10-80'sC, RH=80%. 8. Dimensions: (8.66 x 3.94 x 6.10)'' / (22 x 10 x 15.5)cm (L x W x H). 9. Color: White. 10. Weight: 139.34 oz / 3950 g. 11. Brand: UNI-T. 12. Model: UTP305D. 13. Plug Type: US Standard. Package Includes: 1 x DC Power Supply. 1 x Power line. 1 x Insurance tube. 1 x Manual . Details pictures: " ..